Children of all ages, including toddlers, can benefit from mini trampolines. They aid in muscle and bone development and in improving coordination, motor skills, and tenacity at physical activities. In itself, coordination involves improved timing, rhythm, agility, and balance. In addition, children who enjoy physical activities at a young age may continue to engage in them as they grow older. For safety, make sure that toddlers and less coordinated children have sturdy, foam-covered handle bars for support. Parents recommend covering the foam with duct tape because kids easily tear or bite it off. Also for safety, these trampolines have a cover around the jumping mat that protects kids from the frame and bungee cords, tension bands, or springs that support the mats. Most of these trampolines weigh 14 to 20 pounds and are easily moved. Keep in mind that the measurements given are for the diameter of the frame. The jumping surface is smaller. Also, parents report that enclosures make trampolines more difficult to assemble. 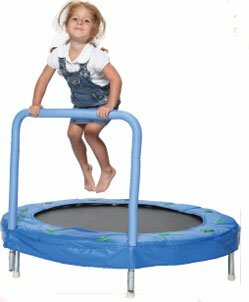 Below is a list of some of the best mini trampolines for kids. 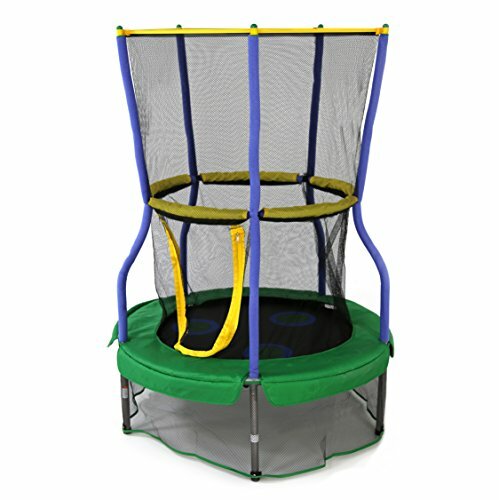 The Little Tikes 3′ Trampoline has handle bar that crosses the center of the jumping mat, increasing the stability of the tramp and allowing two children to use the bar. It has a weight limit of 60 pounds. According to parents, the handle bar can be removed for older kids. The frame is made of plastic and metal and is meant for indoor use only. 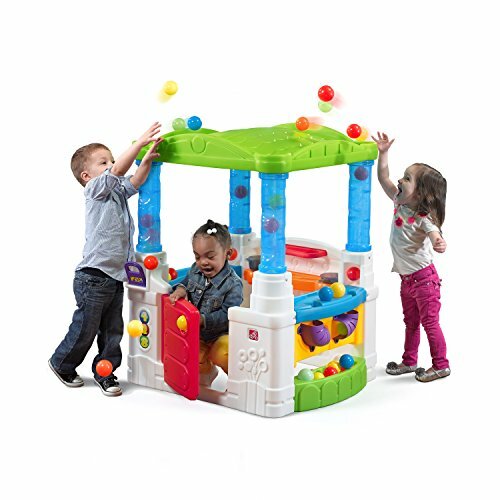 The Pure Fun Kids Pre-School Jumper offers a padded hand rail along one side of its rectangular jumping mat. The red, blue, and yellow padded cover for the springs features the letters of the alphabet inside of squares, circles, triangles, and diamonds. 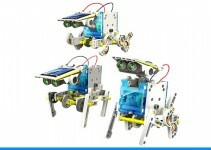 It’s designed to aid recognition of colors, shapes, and letters. 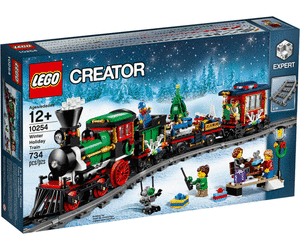 The frame measures 41″ x 12″ and weighs 22.9 pounds. It has a 75 pound weight limit. The Portable and Foldable Trampoline from Gymenist also measures 36″ in diameter, but the handle bar attaches on one side, not across the center. Parents debate about whether this tramp can be used by two children at a time or only one. This tramp easily folds up for storage or to take with you in the car. It comes with a carry bag and bungee cord to pack the pieces when the tramp is folded. The tubular frame supports up to 150 pounds, and the tramp can be used indoors or outdoors. The JumpKing Mini Oval Trampoline has two 24″ handlebars, one on each side of the tramp, which stabilizes the tramp and allows two children to play at the same time. This tramp is made for inside or outside. The rust-resistant, galvanized steel frame forms a 38″ x 66″ oval, and the jumping mat is supported by sturdy 3.5″ galvanized steel springs. The springs are covered by a purple mat decorated with whimsical animals. Coordinating foam-filled purple sleeves cover the handle bars. The tramp has a 110 pound weight limit. 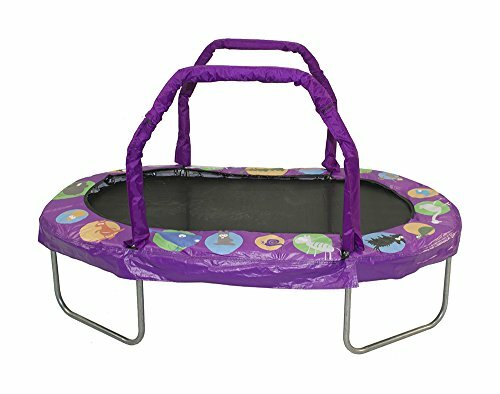 The Bazoongi 48″ Bouncer Trampoline has a removable padded handle bar that can be adjusted to two different heights as kids grow. However, the handle bar is on only one side of the tramp. This bouncer uses durable, galvanized steel springs, and can be used indoors or outdoors. It has a 110 pound weight limit. Because it has small parts that represent a choking hazard, it is not recommended for children three years of age or under. 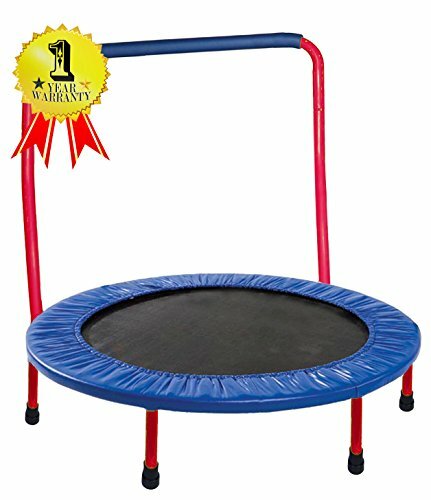 Even though it does not have a handle bar, the Stamina 36″ Folding Trampoline is listed as a best-selling children’s trampoline. This tramp has an all steel frame, yet it folds and weighs only 11.4 pounds, so it is highly portable, and it can go with you in the car. The jumping mat is supported by 30 tension resistance bands that measure 2″ wide. With a 250 pound weight limit, parents can use it, too. The 40″ Lily Pad Adventure Bouncer from Skywalker Trampolines comes with an enclosure around both the upper jumping surface and the legs. The lower enclosure prevents toys, children, and pets from going under the trampoline. The upper enclosure has an opening with a double-sided zipper. Children can unzip it to let themselves out, but make sure that they don’t use the tramp without zipping it closed. They could be hurt if they fall out. A padded foam handle bar extends completely around the enclosure so that more than one child can use it for support. This tramp has a weight limit of 100 pounds and is recommended for ages three to seven. With the enclosure, this tramp measures 56″ high. and some parents find it awkward to move. It will not fit through a door without being disassembled, so parents use it either exclusively indoors or exclusively outdoors. Those who use it outdoors recommend protecting it with a cover when it’s not in use and moving it to an enclosure during windy or winter weather. 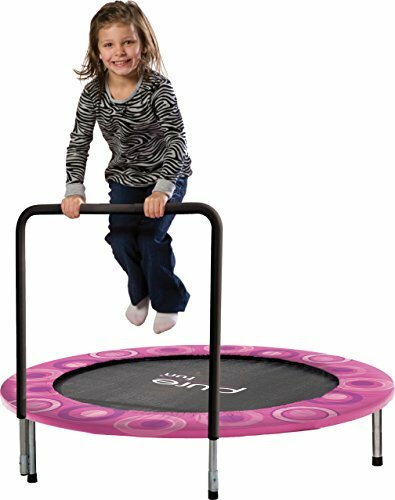 The 54″ Round Kids Mini Trampoline with Net Pad Rebounder from Best Choice Products can be used indoors, but it is made for the outdoors. 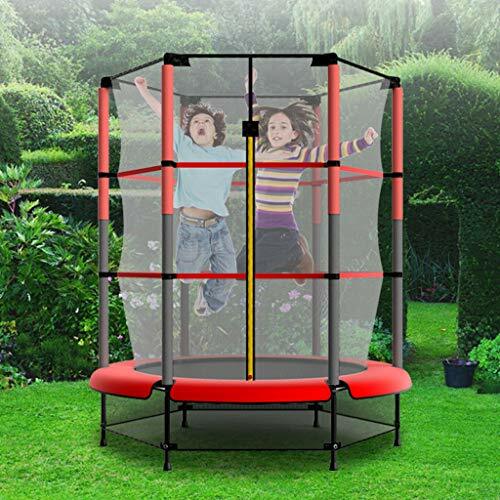 The enclosure surrounds both the jumping surface and the legs and is made of weatherproof, UV-resistant netting with sewn in elastic net straps that attach it to the frame. 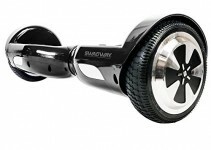 The frame is rust-resistant, heavy-duty metal with rubber feet. The jumping mat is made of a waterproof, heavy-duty, UV-resistant polypropylene mesh fabric, and the protective mat that covers the frame and bungee cords is durable, waterproof, and filled with foam that is reinforced for greater impact protection. The trampoline measures 72 4/5′ high and weighs 34 pounds. It has a 110 pound weight limit. Some parents say two small children can play inside at the same time, but others disagree. This trampoline is recommended for ages three and up. The MaXimus Pro Gym Rebounder is a standard, professional fitness size rebounder for use by older kids and adults. 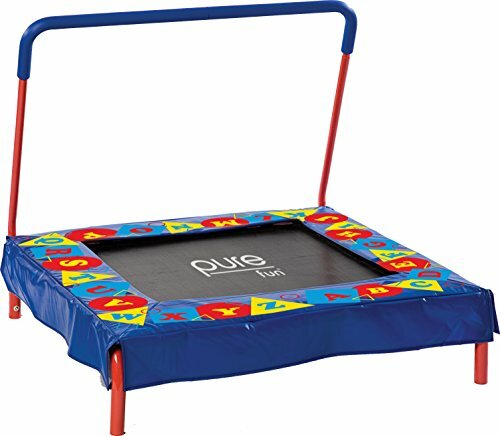 It has a higher, removable handle bar that goes across the center of the jumping mat, and it also comes with a with a DVD that demonstrates proper rebound techniques and includes beginning, intermediate, and advanced workouts. Older children and adults will be able to continue to use this tramp as their fitness levels improve. 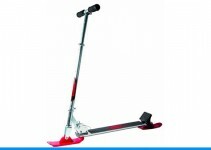 It can even be used for sports training. Because this tramp is for training, it uses an advanced, large spring system that produces a low impact bounce. The tramp measures 40″ in diameter and weighs 26 pounds, so it is more stable for larger users. It has a weight limit of 286 pounds (130 kg). For storage, the spring-loaded legs fold flat against the jumping mat. 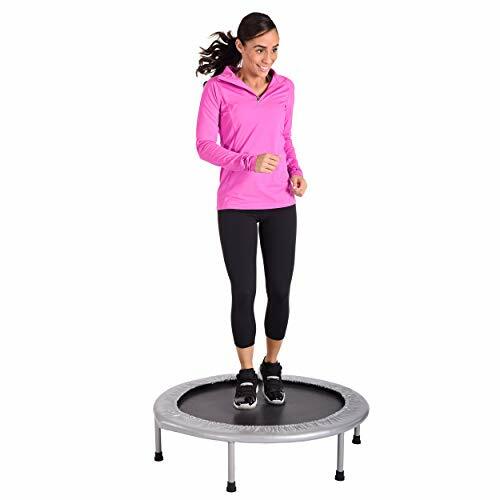 The Pure Fitness 48-Inch Mini Trampoline comes with a handle bar that can be adjusted to three heights for use by older children and adults. The sturdy metal frame weighs 29 pounds, and the jump mat is supported by springs, making this a stable, durable tramp for adults and larger children. Users state that the maximum weight limit is 250 pounds. 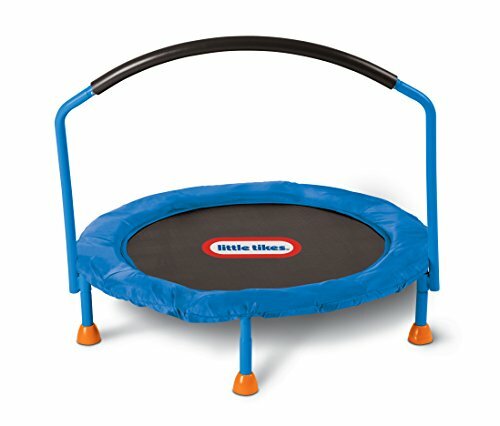 Whatever the age and needs of your child, this list should help you find the right mini trampoline.